Today I just wanted to share a few of my recent Instagram outfits. I am at the point in my pregnancy where I am exhausted so it has been really hard for me to get any outfit pictures done. Yesterday I was in my pajamas all day. I never knew that when she moves it would actually be kind of painful. Sometimes I feel like she is beating me up inside. But I will take it! I am happy she is so active because I know she is ok in there. Although she must be running out of room. I pretty much wake up every two hours at night. So the lack os sleep is killing me. I guess it is our bodies way of preparing us for what it will be like in a couple of weeks. I just can't wait! It could be any day now and I am so excited to meet her! LOVE the braid, Jade! Enjoy these last days. Such a special time. So excited for you! Hopefully you can get a little more rest before she arrives. You look great from your pics! ooh love that shade of pink on you. I recently discovered the perfect cotton candy pink sweater at Old Navy. So glad to see you're doing well. Love these photos! Those Sam Edelman heels are perfect! Great looks too. Beautiful outfit on the 1st photo! 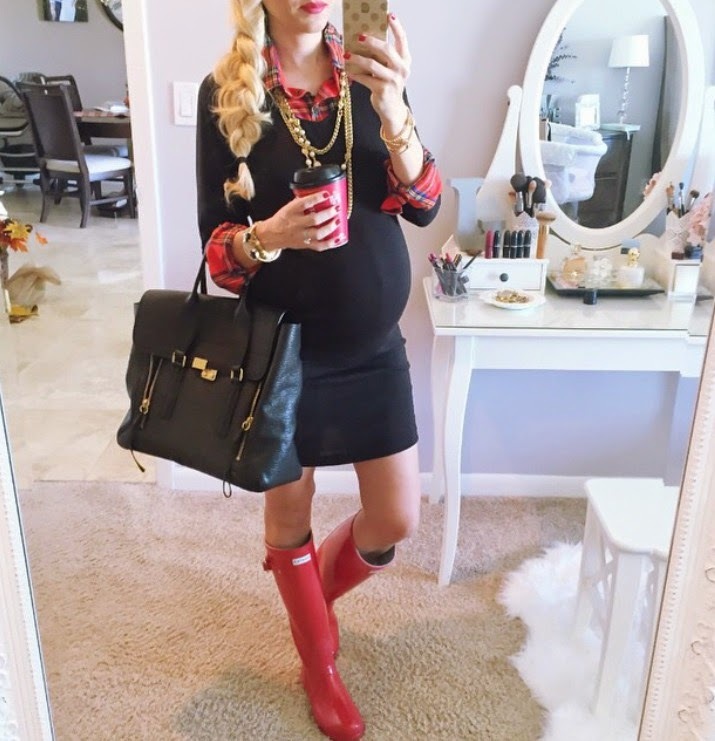 Great outfits lately, I love your red hunters especially! I love the sweater in the first pic. Now I am sad I missed out on the 40% off sale. Your braids look gorgeous!! And you look stunning! I can't imagine how exhausted you must be! Love the purse, and your hair is so pretty! Here is my blog if you want to check it out too. Wishing you all the best! She will be in your arms before you know it! The last few weeks of pregnancy are so hard, but it is so worth it! I remember everyone telling me that I would miss being pregnant and I would just look at them like they were crazy. I am much happier with my babies in my arms rather than my belly! I am snuggled up to my 7 month old daughter and my 3 year old son right now. Love the outfit with plaid shirt.Beautiful! Love those heels . The color is amazing. 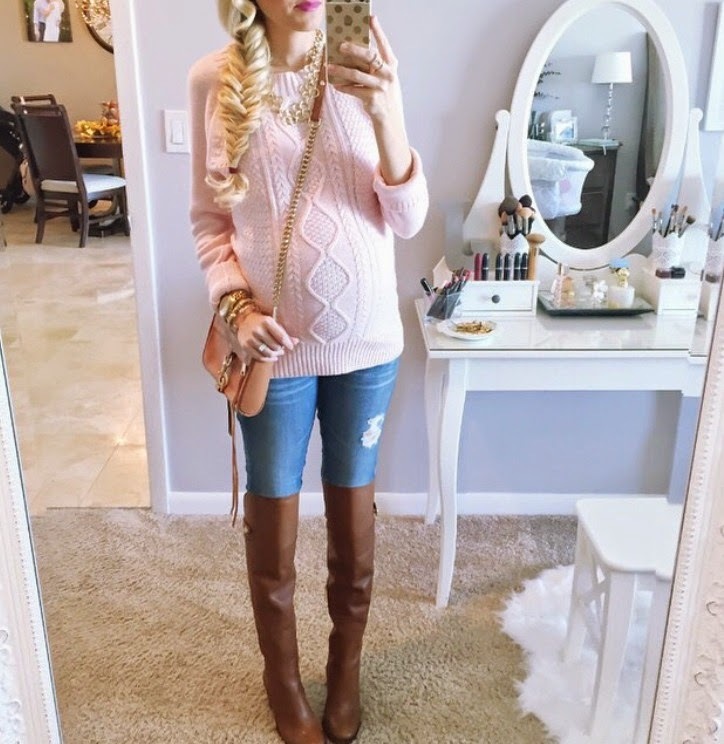 super cute boots in that first photo! you always have the cutest over-the-knee pairs. great post, love the outfits. very cute! the tory burch bag is so gorgeous! I love these looks!! Thanks for sharing the details!